Jason Maloney is an award-winning cameraman, editor and news and documentary producer specializing in foreign affairs coverage. His work has appeared on ABC, CBC, CBS, CNN, Discovery, HDNet, PBS, Nytimes.com and Time.com. He teaches courses on multi-media production and international crisis reporting. In 2014, he launched GlobalBeat, NYU’s international reporting program that brings graduate students overseas for hands-on video reporting for PBS. In recent years, Jason has reported for PBS NewsHour from over 30 countries, covering notable political leaders such as Aung San Suu Kyi, Ellen Johnson Sirleaf, Joko Widowo, Narendra Modi, Paul Kagame, Jose Ramos Horta and Martin McGuinness. 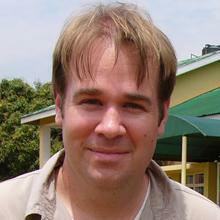 Prior to his work for the NewsHour, Jason produced major programs for Now on PBS and HDNet World Report on UN peacekeeping in the Congo, the Nashi youth movement in Russia, the rise of the Indian middle class, and the 2008 Russia-Georgia conflict. “Uganda’s Silent War”, which Jason wrote, produced, shot and edited in 2007, won the Robert F. Kennedy Award, a First Place National Headliner Award and earned two Emmy Nominations. In 2006, Jason developed and served as editorial producer on a duPont award-winning documentary for the New York Times on nuclear proliferation. In the summer of 2004, he traveled with current UN Ambassador Samantha Power to the Darfur region of Sudan to report for the CBS News 60 Minutes on the humanitarian crisis there. While based in Southeast Asia in 2002, Jason produced, shot and edited “A Dirty War” for PBS NOW with Bill Moyers on the civil war in Aceh, Indonesia. In 1999, he produced his first independent documentary while on an International Reporting Project fellowship in Guinea-Bissau. From 1996 to 2001 Jason worked at ABC News Primetime Live, with assignments that took him from Siberia to Yemen to the American South. Jason holds a BA from Dartmouth College and a Masters from the London School of Economics. He is a member of the Council on Foreign Relations and the Directors Guild of America. Jason is the co-author of Your America, published July 2008 by Palgrave MacMillan. Jason is co-founder of the Bureau for International Reporting (BIR) – a non-profit organization dedicated to producing and providing vital international television news programming to an American audience.